Maxillo is an orbital volume computation application for use by otolaryngologists, ENTs, plastic surgeons, craniofacial surgeons, and maxillofacial researchers. It enables the use of computed tomography (CT) scans of the orbital area to be analyzed as part of diagnostics, pre-surgical planning and post-surgical analysis method. Windows 7, 8, 8.1, 10, and Server; 32 and 64 bit versions. Mac OSX is currently not supported natively. Although, the software is known to run well under Parallels and/or VMWare. We recommend downloading and trying the trial version prior to purchase. Load DICOM scans (designed for CT only). Place landmark points on extracted surface to denote anatomic points of interest. Utilize a patent-pending segmentation method for extracting the bony orbit contour shape directly from the CT scan. Export extracted orbit contour surfaces as PLY, OBJ, or STL. Easy to use and interactive manipulation of the volume, surface, and landmark points. 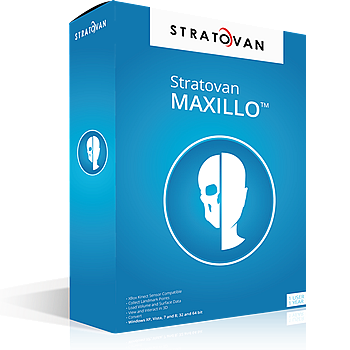 Stratovan Maxillo™ computes orbit (eye socket) volumes and bony contour shapes directly from x-ray computed tomography (CT) image data. Maxillo is intended for research use only by otolaryngologists, ENTs, plastic, and maxillofacial researchers investigating orbit morphology, shape, volume, and globe position. Maxillo utilizes a patent-pending image segmentation method. Compute a bony orbit volume in under five minutes. No more manual tracing of segmentations slice by slice. Maxillo performs the segmentation automatically. Accurate orbit volumes to within 1cc. Handles normal, repaired, and trauma patient CTs. Less than 1cc error between operators. Easy to use interface to ensure reproducibility. Image A shows the expansion process in the orbit interior. Image B shows the delineation of the anterior orbit opening; resulting in a reliably defined anterior surface. Image C shows a cut-away of the extracted orbit countour surface. Slices through the extracted orbit contour for axial, coronal, and sagittal planes. The blue circle indicates the globe. Notice that soft-tissue does not interfere with the process; the delineation method is invariant to tissue swelling. Also notice the air pockets within the orbit interior (most clear in the coronal and sagittal images). These air pockets are small and do not cause any issues with the delineation method. Strong, E. Bradley M.D., Fuller, Scott C. M.D., Chahal, Harinder S. M.D. (2013). Computer-Aided Analyis of Orbital Volume: A Novel Technique, Ophthalmic Plastic & Reconstructive Surgery, 29(1), 1-5. Pham D.L., XU C.Y., and Prince J.L., (2000). A survey of current methods in medical image segmentations, Annu, Rev. Biomed. Eng., 2, 315-337. Ramieri G, Spada M.C., Bianchi S.D., and Berrone S., (2000). Dimensions and volumes of the orbit and orbital fat in posttraumatic enophthalmus, Dentomaxillofacial Radiol., 29, 302–311. Pohle R., and Toennies K.D., (2001). Segmentation of medical images using adaptive region growing, Proc. SPIE Med. Imag. : Image Process., 4322, 1337-1346. Strong, E. Bradley M.D., Fuller, Scott C. M.D., Wiley, David F. PhD, Zumbansen, Janina M.D., Wilson, M. D. PhD, and Metzger, Marc C. MD, DMD, PhD, (2013). “Preformed vs Intraoperative Bending of Titanium Mesh for Orbital Reconstruction, Otolaryngology- Head and Neck Surgery, 149, 60-66. Cornelius CP, Mayer P, Ehrenfeld M, and Metzger MC, (2014). The orbits--anatomical features in view of innovative surgical methods, Facial Plastic Surgery, 30, 487-508. Zhang Z, Zhang Y, He Y, An J., Zwahlen RA, (2012). Correlation between volume of herniated orbital contents and the amount of enophthalmos in orbital floor and wall fractures. J Oral Maxillofac Surg., 70, 68-73. Zhang ZY, He Y, Zhang Y, An JG, (2010) Evaluation of the application of computer-aided shape-adapted fabricated titanium mesh for mirroring-reconstructing orbital walls in cases of late post-traumatic enophthalmos. J Oral Maxillofac Surg., 68, 2070-2075. Farkas LG, Posnick JC, Hreczko TM, Pron GE, (1992). Growth patterns in the orbital region: a morphometric study. Cleft Palate Craniofac J., 29, 315-318. Karmese, Mehtap, Akdağ Osman, Selimoğlu, Muhammed Nebil, Koplay, Tugba Gun, Bakbak, Berker, Koplay, Mustafa, and Tosun, Zekeriya, (2015). Analysis of unilateral complex orbital fractures with a new treatment algorithm, Journal of Plastic Surgery and Hand Surgery, 49, 121-126. Osaki TH, Fay A, Mehta M, Nallasamy N, Waner M, De Castro DK, (2013). Orbital Development as a Function of Age in Indigenous North American Skeletons, Ophthal Plast Reconstr Surg., 2, 131-136. Ellis E 3rd, (2012). Reconstruction of orbital floor defects, Journal of Oral and Maxillofacial Surgery : Official Journal of the American Association of Oral and Maxillofacial Surgeons, 70, 2255. Baino F., (2011). Biomaterials and implants for orbital repair, Acta Biomaterialia, 7, 3248-3266. Ellis E 3rd, (2014). Surgical approaches to the orbit in primary and secondary reconstruction, Facial Plastic Surgery, 30, 537-544. Ellis E 3rd, Perez D, (2014). An algorithm for the treatment of isolated zygomatico-orbital fractures, Journal of Oral and Maxillofacial Surgery : Official Journal of the American Association of Oral and Maxillofacial Surgeons, 72, 1975-1983. Nysjö, Johan, (2011). Orbit Segmentation for Cranio- Maxillofacial Surgery Planning, Upsalla University - Department of Information Technology, 1-59. Song SY, Hong JW, Roh TS, Kim YO, Kim DW, Park BY, (2009). Volume and distances of the maxillary sinus in craniofacial deformities with midfacial hypoplasia, Otolaryngol Head Neck Surg., 141, 614-620. Lieger, O., Richards, R, Liu, M, Lloyd T, ( 2010). Computer-assisted design and manufacture of implants in the late reconstruction of extensive orbital fractures, Arch Facial Plast Surg., 3, 186-191. Forbes G, Gehring D.G., Gorman C.A., Brennan M.D., and Jackson I.T., (1985). Volume measurements of normal orbital structures by computed tomographic analysis quantitative volumetric assessment of orbital soft tissue, AJNR, 6, 419–424. Krahe T, Schlolaut K.H., and Poss T, et al. (1989). Computed tomographic volumetry of the orbit in endocrine orbitopathy, Rofo., 151, 597–601. R A Nugent, R.A., Belkin, R.I., Neigel, J.M., Roodman, J., Robertson, W.D., Spinelli, J. and Graeb, D.A., (1990). Graves orbitopathy: correlation of CT and clinical findings, Radiology, 177, 675-682. Zonneveld F.W, Koornneef L., and Wittebol-Post D. (1991). Quantitative volumetric assessment of orbital soft tissue, Computer Assisted Radiology, 181-186. Lutzemberger L, and Salvetti O., (1998). Volumetric analysis of CT orbital images, Med Biol Eng Comput. 36, 661–666. Bijlsma W.R., and Mourits M.P. (2006). Radiologic measurements of extraocular muscle volumes in patients with Graves’ orbitopathy: a review and guideline, Orbit. 25, 83–91. Regensburg, N.I., Wiersinga, W.M., van Velthoven, M.E.J., Berendschot, T.T.J.M., Zonneveld, F.W., Baldeschi, L., Saeed, P. and Mourits, M.P., (2009). Age and gender-specific reference values of orbital fat and muscle volumes in Caucasians, British Journal of Ophthalmology, doi:10.1136/bjo.2009.161372. Alsuhaibani, A.H., Carter, K.D., Policeni, B. and Nerad, J.A. (2010). Effect of orbital bony decompression for Graves' orbitopathy on the volume of extraocular muscles, British Journal of Ophthalmology, 95, 1255-1258. Weaver, A.A., Loftis, K.L., Tan, J.C., Duma, S.M., and Stitzel, J.D., (2010). CT Based Three-Dimensional Measurement of Orbit and Eye Anthropometry, Investigative Ophthalmology & Visual Science, 51, 4892-4897.